Imagine being treated as well at your doctor's office as you are at your favorite restaurant. That's how healthcare should be, and that's where it's going. Despite the numerous parallels between the experiences of restaurant diners and those of healthcare consumers in appointment-based settings, there is a significant discrepancy between the level of service a consumer can expect of each industry. Of course one fundamental difference is the discretionary nature of restaurant experiences, which has resulted in an industry that is inherently consumer-driven. Restaurants have developed a collective culture of service excellence, and easily outperform healthcare organizations on standardized customer satisfaction metrics (American Consumer Satisfaction Index, 2015). Now, a combination of factors including changing healthcare consumer expectations (The Advisory Board Company, 2016), the introduction of value-based reimbursement models (Millenson, 2012) and the revelation that superior patient experience correlates with higher profit margins (Ellison, 2016) have made patient satisfaction more essential than ever to the success of healthcare organizations. In this new era of consumer empowerment and choice, healthcare leaders can improve patient experience by applying the customer service principles that keep restaurant diners coming back for more. 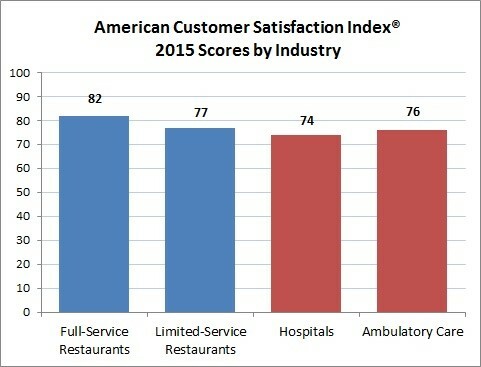 When compared to that of the restaurant industry, customer satisfaction in healthcare is discouragingly low. In fact, according to the American Customer Satisfaction Index® (ACSI), consumers today are more satisfied with the service at establishments selling paper-wrapped hamburgers than at hospitals providing life-saving care to their communities. A tough pill to swallow: consumers prefer the service in fast-food restaurants to that in hospitals or doctor's offices (ACSI, 2015). Imagine a restaurant that focused only on the quality of the food; even if the cuisine was exceptional, customers would soon abandon the establishment for competitors offering comparable meals and a superior experience. This is the state of much of the healthcare industry today, and for Rohit Verma, Ph.D., Director of Cornell University's Institute for Healthy Futures, it's clear why. Dr. Verma notes that as Western medicine became increasingly industrialized, the human connection was lost. Medical education has underemphasized customer service, and generations of providers were taught to focus nearly exclusively on clinical performance. What we now realize is patient satisfaction scores correlate with key clinical outcomes including inpatient mortality (Glickman et al, 2010) and hospital readmission rates (Boulding et al, 2011). The good news is despite the pervasive frustrations of US healthcare consumers, there are positive trends toward emphasizing patient experience. In a 2015 study by The Beryl Institute, over half of the 683 US hospital executives surveyed included patient experience among their top three priorities. However, the organization's President Jason Wolf, Ph.D. says despite the abundance of literature demonstrating the imperative to improve experience, there are relatively few resources offering practicable approaches to this goal. With that in mind, healthcare organizations seeking to keep pace with changing consumer expectations can start by applying the following restaurant-inspired customer service tactics. Bon appétit! 1. Deliver personalized service. The cornerstone of personalized service is preparation. Toward that end, service-minded restaurants hold a brief meeting with the entire staff before the first customer arrives to review the day's schedule, often highlighting individual customers. A manager may say, "The Smiths are coming in tonight at 7:30. It's their anniversary, so let's be sure to offer congratulations and seat them at the booth they like. We were out of Mrs. Smith's favorite wine last time they were here, so let's pull a bottle aside now to make sure they can enjoy it tonight." This same customer-centered approach can be applied to improve patient experience in clinical settings. Goal: Delight scheduled patients by responding to their individual preferences, needs and interests. Tactic: Before patients arrive, hold a briefing with staff to review the schedule for the day, highlighting at least one patient and discussing ways to delight that person. To facilitate this practice, include a space in each patient's file for taking non-clinical notes, and empower everyone in the clinic to enter information into this area. Recording and acting on these items strengthens relationships with your patients; rather than launching into test results, your providers can begin a clinical interaction with "How did your granddaughter's soccer game go last week?" Start with your established patients, and then train staff members to discuss each new patient's preferences when scheduling initial appointments. You may find out there is a certain time of day or day of the week that best fits the patient's schedule, or even a certain room temperature at which they feel most comfortable. By delivering service that acknowledges a new patient's personal preferences from day one, you set the stage for sustained customer loyalty. Considering everything providers already know about their patients, there is an incredible opportunity for personalization in healthcare - and perhaps in no other industry is it more feasible to achieve. In the near future, healthcare consumers in appointment-based settings will expect their providers to deliver care as personalized as the service at their favorite restaurants. In the meantime, the few organizations that effectively personalize service for their patients will find a distinct competitive advantage as more consumers make experience-based healthcare choices. 2. Greet established customers by name. Imagine your next medical appointment. As you walk up to the desk, instead of hearing the typical, aloof, "...Name, please?," you are greeted with a friendly, "Good afternoon Ms. Jones, I'll check you in. Please make yourself comfortable." When you are greeted by name, your anxiety decreases immediately - the team has demonstrated their preparedness to meet your needs. According to Associate Professor Alex Susskind, Ph.D., faculty member at Cornell's Institute for Healthy Futures, it's quite common for service-oriented organizations to greet their guests by name. Still, Susskind says this proven driver of customer delight has been all but ignored in the healthcare industry, which creates another opportunity for differentiation. Using just your existing resources and a minimal commitment, your front-line staff can blow away your patients' expectations the moment they walk through the door. Goal: Welcome established patients by name when they arrive for scheduled appointments. Tactic: At first, greet by name just the first three scheduled patients each day. During your morning briefing, review and help front-line staff members memorize the first three scheduled patients. Each patient's file almost certainly contains a photocopy of the patient's identification, so with a little encouragement and one minute of practice, staff can begin greeting guests by name right away. For the first week, focus your staff on greeting by name only the first three scheduled patients of the day. Move to greeting the first ten patients by name in week two, and be sure to relay to staff members any and all compliments you hear from patients about this new level of service. Within a few weeks, this practice will become automatic, and staff should be able to greet each scheduled patient by name. This in itself will establish a striking difference between the patient experience at your organization and that offered by your competitors. Establishing a human connection by knowing your patients' names is just the start. Once your staff members are trained in this high-service mindset, they will become an abundant source of ever better ideas for improving satisfaction among your patients. 3. Be accountable for service recovery. One of the most noteworthy elements of restaurant service culture is the ability to recover from service failures. The industry's success at turning a less-than-satisfied first-time diner into a loyal repeat customer has a lot to do with the fact that restaurants take accountability for unforced errors that could detract from a customer's experience. Did you wait too long after your reservation time to be seated? A service-minded restaurant may send over a small complimentary appetizer to get the experience back on track. Did your steak come out overdone? You will likely be offered a replacement steak cooked to perfection, and you probably won't pay full price for the meal. The message is, "This mistake was our fault. We want to continue having the pleasure of serving you, so it's our responsibility to correct it to your satisfaction." Healthcare organizations should hold themselves to at least that same standard in response to dissatisfying patient experiences. Think about the last time you waited for what you believed to be an unreasonable amount of time beyond your scheduled healthcare appointment; it's safe to assume you still paid in full for that visit, no matter how much it affected the remainder of your day. Goal: Recover from service failures to enhance customer loyalty and avoid abandonment. Tactic: When necessary, lower or waive a dissatisfied patient's copayment or fee. One organization that has implemented such a program is Geisinger Health System in Pennsylvania (Ellison, 2015). The system's mobile app enables patients who are less than satisfied with their experience to request a refund of some or all of their copayments. Remarkably, their patients determine the portion of the copayment that is refunded, taking this approach to a new level. In appointment-based settings, there may only be a brief window of opportunity for this type of service recovery, so every member of the team must be authorized to engage with dissatisfied patients in real time. A front desk clerk may be the only person who is able to get a relationship-damaging experience back on track by first acknowledging a patient's concerns and determining what reasonable steps can be taken to correct the issue. In situations where an apology isn't enough, your team should have the authority to waive a customer's copayment or fee, cover their parking or transit cost, hand them a $5 Starbucks gift card or perform some other action that is meaningful to that patient. Set a dollar amount under which your staff can confidently conduct restaurant-style service recovery as they see fit, and make it clear that you expect them to do so. Track the use of this tool by each staff member, referencing against contemporaneous customer satisfaction scores. When you take real accountability for service failures, would-be complaints actually become the drivers of sustained customer loyalty, and offer you a roadmap to further improvement. According to Dr. Wolf, there are four key outcomes for healthcare organizations: clinical outcomes, financial outcomes, customer loyalty and community reputation. Unsurprisingly, patient experience is the only factor that drives each of these outcomes. Organizations that focus on exceptional patient experience, says Wolf, tend to provide superior clinical care, achieve better financial outcomes, enhance loyalty among their patients and establish a reputation for excellence. Healthcare consumers don't distinguish between quality, safety, efficacy and service – what they perceive is their overall experience. Patient experience expectations are beginning to reflect consumer expectations in other industries (Deloitte, 2014), presenting a remarkable opportunity for healthcare organizations willing and able to offer superior customer service. Dr. Verma notes that high-quality care is relatively consistent across the industry; patient experience is now the principal area of variance between competitors, and thus has become the most valuable source of opportunities for differentiation. One reason these practices have such a profound effect on customer loyalty has to do with what Dr. Susskind refers to as "habituated expectations." He has found that over many service interactions, consumers learn to expect a particular level of service at certain categories of establishments. Since habituated expectations of healthcare consumers are much lower than those of restaurant diners, healthcare organizations can easily exceed the customer service expectations of their patients by borrowing a few proven tactics from the restaurant industry. If you've ever been the recipient of service that exceeded your own expectations, you know it's a recipe for delight. Jeff Blake is a healthcare strategy and communications professional specializing in healthcare business development, patient satisfaction, strategic growth and corporate communications.